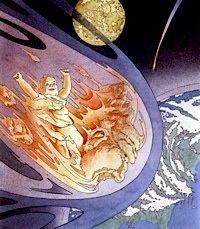 The creation story for planet earth via planetesimals. llustration by Gustav Moore. The K-8 curriculum laid out in the National Science Foundation project “Beyond Stone Walls” was developed principally by classroom teachers, graduate students, and faculty in the school of education. Its goal was HOW to teach the science standards, using a transdisciplinary framework. The WHAT to teach (the discipline-specific content beneath the curriculum) was so broad, we decided to put together a one-stop reference guide to the subject of stone walls in general, and to the book Stone Wall Secrets in particular. With this guide, a teacher or curriculum designer can easily upgrade their knowledge of many related subjects. Copyright Warning: This document contains text material protected by Copyright ©1998 to Kristine and Robert Thorson under the title Stone Wall Secrets, Kristine and Robert Thorson. Copyright to the illustrations is to Gustav Moore, reproduced in low resolution format with permission. 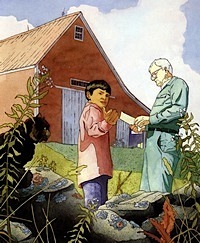 Stone Wall Secrets was published by Tilbury House Publishers, Gardiner, ME (1998). Please do not copy teacher’s reference for distribution without permission. Adam wonders whether to sell the old stones or not.